Welcome to another Buffalo Stamps and Stuff Monday Idea. Today's idea is to make a Box Card. Piece of Acetate for the window, also run through the embossing folder. 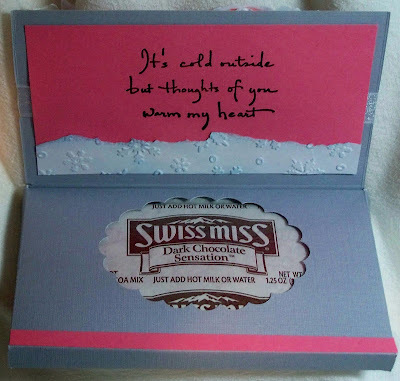 Two packages of Swiss Miss hot chocolate. gift cards. Punching the window is optional, but fun to see what is tucked inside. Hope you get a chance to try this project, I'm sure you will love the results. Oh this brought a smile to my face...a perfect combination of image and project...super fun for a gift during these cold days! what a lovely boxcard sue, beautiful made. look so cute and adorable. Great idea, as always, Sue! I love how you tied in that cute image with the hot chocolate, great project! What a fun idea - I could use some hot chocolate right now! 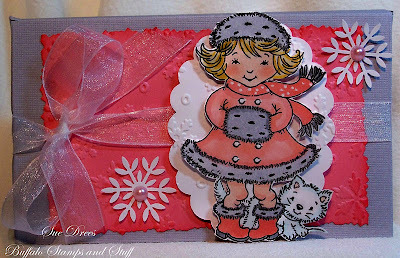 Gorgeous box card Sue,love the idea, so great for little gifts or for a gift card!